Home Ecommerce Platform iOS vs Android: Both Worth Your Investment? You may have heard Android leads Apple in mobile operating system share, yet Apple still leads in app variety, downloads, usage and revenue (for now). As a marketer faced with pressure to go mobile, can you prioritize your mobile development between platforms, or are they both essential to your business? It’s not completely about OS (device) share. You must also consider app share, time share and revenue share — and realize the landscape is shifting month to month. Android’s currently owns device share thanks to the wide range of manufacturers that run the OS, though its share has shrunk from its 54% peak in October to 52% in April (whilst Apple increased from 34% to 39% in the same time span). 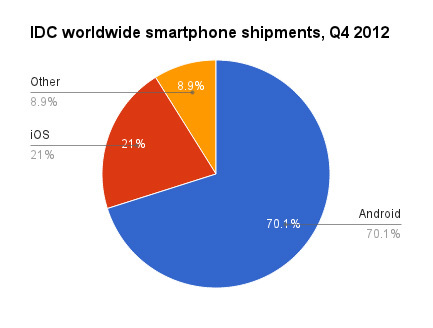 According to IDC, 70% of smartphone shipments were Android in Q4 2012. 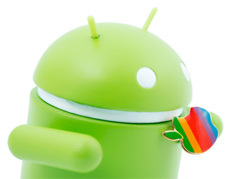 It’s unlikely that Apple will close the gap on Android, especially with lower-priced devices in the Droid camp. Though iPad currently leads tablets, that position may also change. Android users download 2.5 billion apps per month from Google Play alone, 25% more than iOS’ 2 billion. 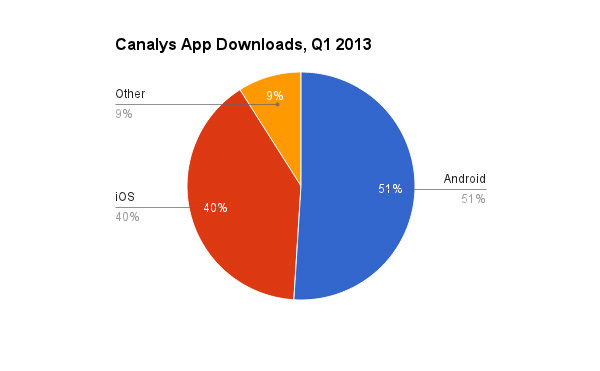 Canalys reports that Android bit 51% of the app download pie, Apple only 40% in Q1 2013. 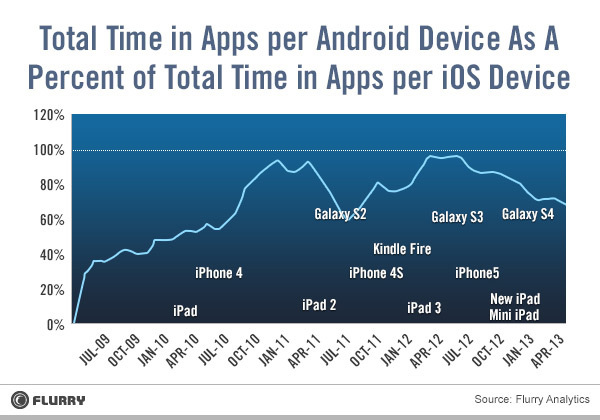 Both Experian and Flurry report that users spend more time on Apple devices than Droid. 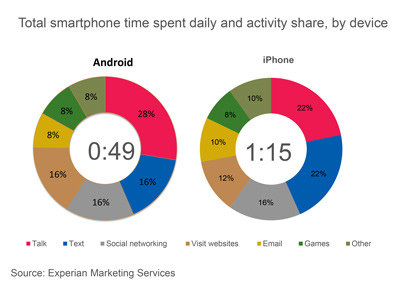 Experian reports iPhone users spend an average of 26 more minutes per day with their device than Android owners. Android users spend more time talking and Web surfing, and Apple users spend more time texting, emailing, taking photos and social networking. The question is do Apple or Android users spend more time in commercial apps like retail or games vs. utility and social networking? Apple’s App Store currently drives more revenue than Google Play. This may be due to its greater selection of apps, iOS user behavior (more time spent with monetized apps), or be skewed by heavier iPad use. The iOS App Store’s top 200 grossing applications earned $5.1 million in revenue per day in April, 4.6 times higher than Google Play. 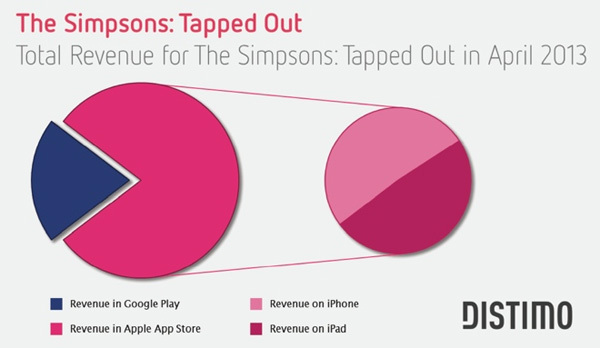 One example of the spread between platforms is Electronic Arts’ The Simpsons: Tapped Out, which earned a total of $4.8 million in April. 79% of that bounty came from iOS, the remaining 21% from Android. 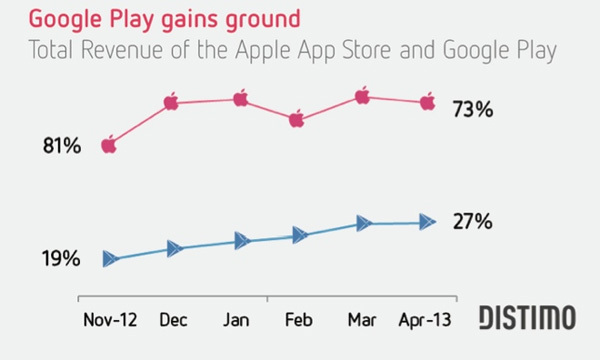 Nevertheless, Google Play has made revenue share gains, rising from 19% to 27% in just 6 months. Android’s not out of the game. Should you have an Apple or Android app? In a perfect world, you serve all possible consumers (including Blackberry and Windows 8). You *should* develop for both Apple and Android. That is, if you believe you need an app at all (you could alternatively double down on HTML5). 1. It’s simpler to develop for iOS because there’s less hardware models and OS versions to test for and maintain than Android’s fragmented ecosystem. 2. Apple owners appear to use apps more than Android owners (highly speculative). 3. Apple leads in revenue, suggesting Apple users are more spend-happy. 4. Customers expect an Apple app, Droid users are used to less app options for their devices. However, this strategy is not future proof. Android’s continuing to blow up. If resources are tight that you can’t develop for both, take a serious look at HTML5. Applying all your resources to a solution that can serve all mobile users is worth the sacrifice of a few features that native may offer that HTML5 doesn’t (yet).